Since the last post, I have been gradually typing up the background to my campaign so that I may add it to the "Arcana and Lore" section of the Main Menu. It's something easy to work on while I am still adjusting to the events of the last month. Originally, I had intended to add much of this material through various other gameplay aspects such as "readable" books and scrolls. However, having recently experienced the way the "Codex" had been implemented in Dragon Age, I considered some of this "background" information for my campaign is better handled in the same way. Note: I already had a Rule Information tab, which acts in a similar way to one aspect of the DA Codex, but I have now included the additional "Lore & Arcana" tab within the Main Menu to cover more detailed lore and background information of the campaign. i.e. The kind of stuff that I have written up as a "Dungeon Master" in a pen and paper game, which would normally not be directly available to the player. The latest rendition of the Main Menu showing the Lore & Arcana tab. 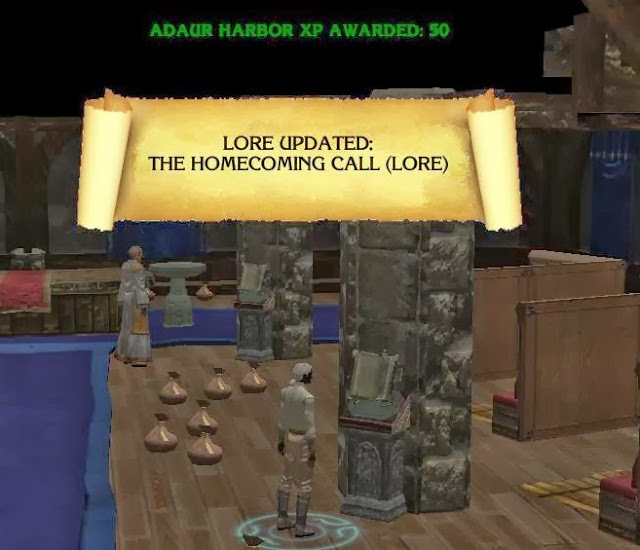 The various aspects of Lore and Arcana will gradually be uncovered by the player as they adventure throughout the campaign. At each new discovery, a node will be unlocked in the tab conversation menu allowing the player to read as much of the information as they wish. Discoveries can be made through conversation or interaction with objects, and some bring XP awards for the PCs. So, whereas this kind of information may have once been presented in a readable book format, it will now be presented in the Main Menu after, for example, interacting with a book found laying on a podium. In each case, the latest lore or arcana information will be brought to the attention of the player by a new informative GUI. The PC has just picked up some campaign background lore by reading a book. 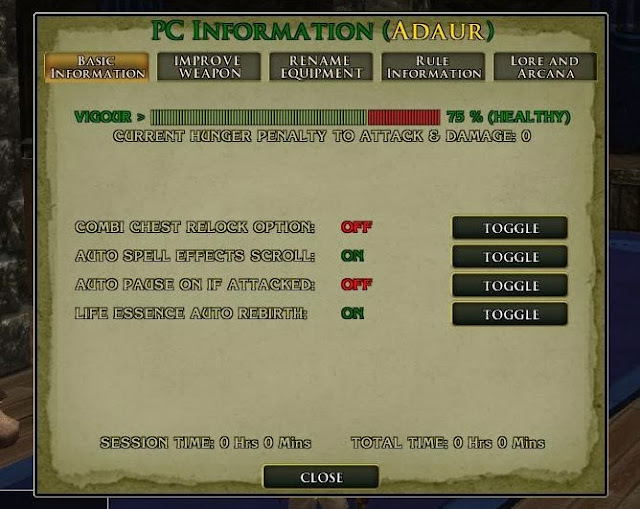 Now the player can use the Main Menu to navigate to the information they have just learned, which remains accessible throughout the campaign. This information is mainly background, but does also serve to help give the player clues and information that may help them understand more about their environment and of items that may be of interest to them. At the very least, it may help to explain the reasons behind the way the campaign is built. Some religious lore indicating how death was not always present in Althéa. The more astute reader may also notice the new scroll bar I have adopted for some of my menus, as seen in the last picture. I have typed up quite a few pieces of information now, but still have some to go, which I will deal with as I get the time. However, I hope to turn my attention back towards coding one of the dungeons I was working on before I started this. One last point I wanted to mention is that I managed to allow PCs to swap weapons while the game is paused. I did this by allowing the game to very briefly un-pause the game (for 0.1 seconds) when the weapon was double-clicked on from either the PC's inventory or one of their hotbars. This small addition to the Tactical Combat System included with the campaign adds a further improvement for those who like to use the pause facility to slow down combat for more of a tactical approach. While I am on the subject of the Tactical Combat System, is there anything else readers would like me to consider for this system? E.g. I am also considering looking at "instant potions". 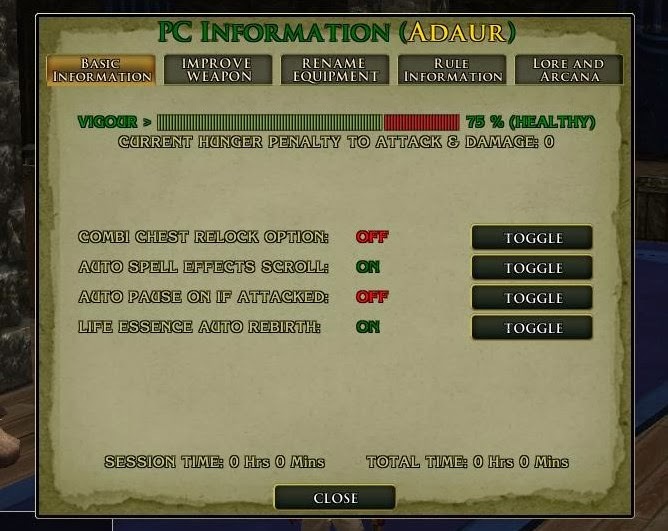 And for those that might mention "pause at the start of an encounter", well that is already in, as well as optional hit point bars for enemies. Interesting. Having the discovered lore available after the fact in some form without having to haul books around is a useful idea (I first remember it in Mechwarrior for Dos). I'm currently thinking about how I would handle an illiterate pc/party, for instance from a barbarian tribe. I don't think I've ever seen a game where the player couldn't read, since the data dump of reading is so ingrained in rpg gaming. Yet the typical medieval person was illiterate, even most people high in society. The literate were few and most knowledge was passed orally. Do you get the party to make rubbings of inscriptions and haul books back for translating? How do they know which book on the shelf is the one that will be useful for them? It becomes an extra step in quests, to bring things back for the scribes to tell you what they mean, and maybe a player will decide that learning to read would be a valuable adventuring skill. Maybe as the DM or module maker you need to figure out how to impart lore in other manners, which can be a challenge for our hypothetical barbarian as she rummages through a crypt. Yes, I know what you mean about "illiterate" PCs. What I concluded, however, was that this information, although usually accessible via books and the like, may also be considered "learned" through experience as well. i.e. Poetic licence for the illiterate characters. However, that all said, I still believe (like you say) that there will still be some tomes or information that the PC (no matter their reading skills) will have to get expert advise on.